I have begun to change the look of things around here. Not simply with Christmas decorations, but I suppose I am starting to make the transition from city to country. Now that the winter months are creeping in, I am looking about and thinking of ways in which we can make changes to our decor. The bathroom renovation absolutely must happen this winter. In speaking to Wilson next door, I told him the tub was leaking. "really?" he said, "I put that tub in back in '58. It's leaking already?" I agreed with dear Wilson, and asked if he warrantied his work. No such luck. Sadly I have yet to find a Canadian distributor, and I really do not like the idea of having to create each stone by hand. I know that other major renovations will have to wait a few years, but I can begin with our furniture and our accessories. 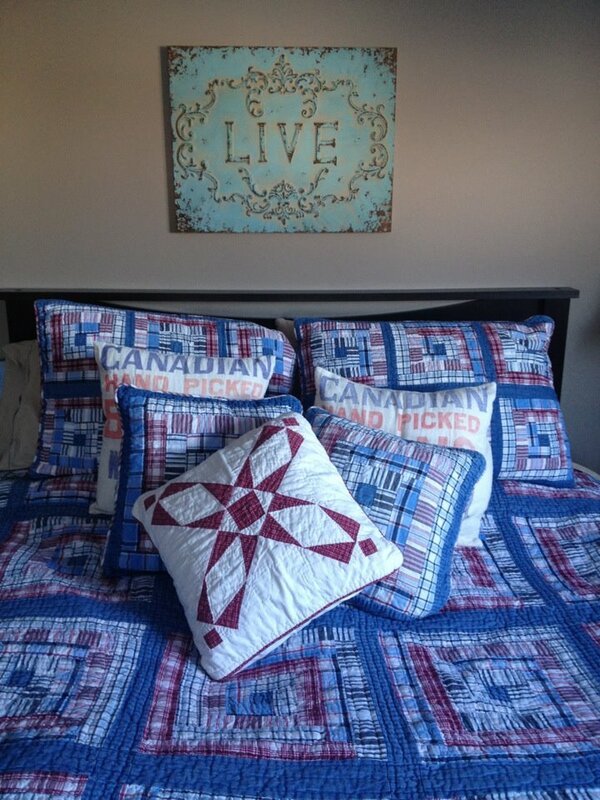 I spotted these lovely cushions on Kijiji, handmade out of old bean sacks. 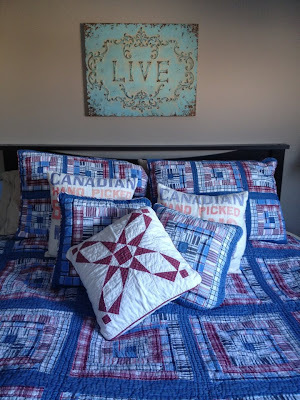 They inspired the new bedding, and the rustic tin artwork above the bed. I have convinced my dear sweet fireman that he should make us a new bed frame out of old barn boards. If I could just convince him to make me the matching night tables and dresser that would be perfect. Baby steps...baby steps!